19 July 2015. 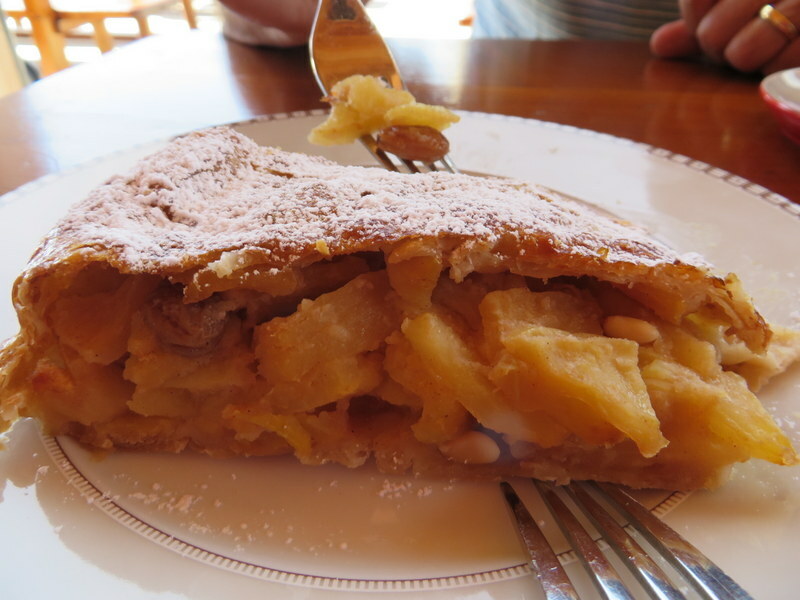 If an apple a day keeps the doctor away, does it count if it’s in your strudel? 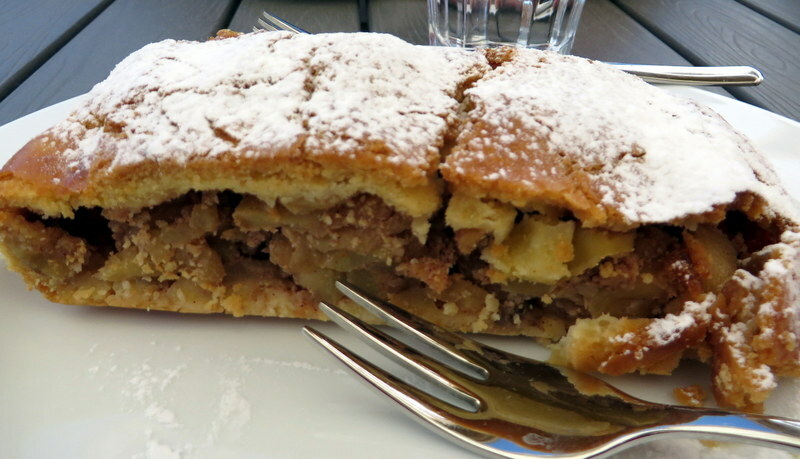 In the Alto Adige/Südtirol, strudel is as prevalent as Starbucks in Seattle. We have eaten many portions and many types over the course of several trips. This time I documented our not-quite-daily habit. Thank God we were hiking! It never ceases to amaze me that no matter where we go, we get coffee in a ceramic cup and our food on plates with real flatware, served by nice people who do not expect a tip. Even at the ruins of a castle, in a tiny little village high above the valley, where the cafe was the size of a closet, the lady served our espresso in tiny ceramic cups with stainless spoons that we carried out to a picnic table. And we could have had grappa if we had wanted! Compare that to the typical U.S. coffee-house or what passes for a restaurant in a national park: Styrofoam cups, paper plates, forks that break when you try to use them, self-service, and the expectation of a 20% gratuity. 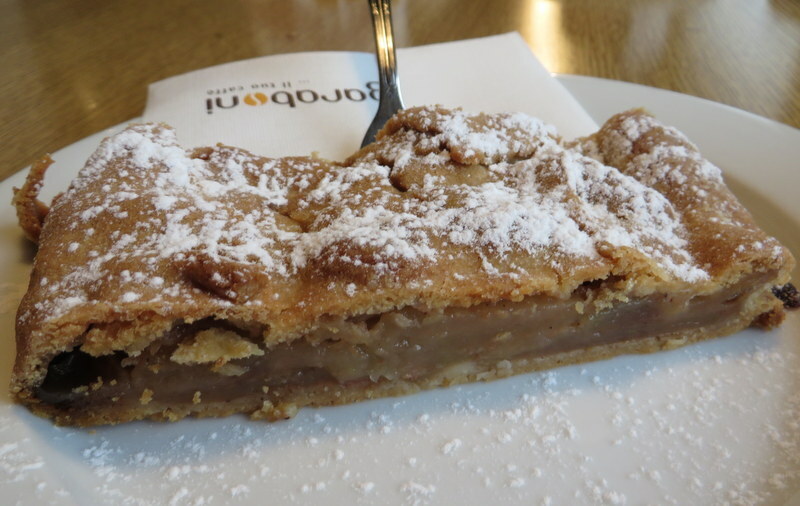 July 8: Rainy day strudel in Selva. Our first strudel of the trip, while taking shelter in the town. Fabulous apple-pie flavor and a light, crust. 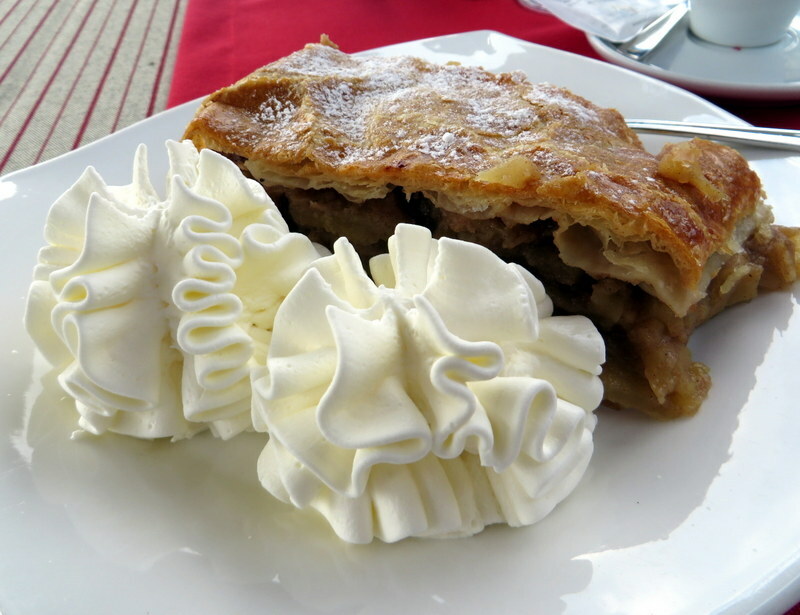 July 8: God help us, a two-strudel day! Anna, our landlady, invited us over in the afternoon for strudel hausgemacht. How could we say no? 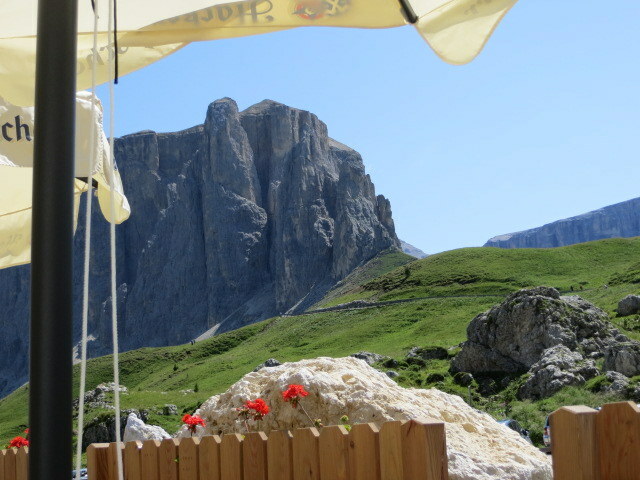 July 9: High-Mountain strudel at Passo Sella. We had a long hike, punctuated by a stop for healthy yogurt, so we indulged in a cinnamon-flavored, raisin-packed variety with a more cake-like crust. 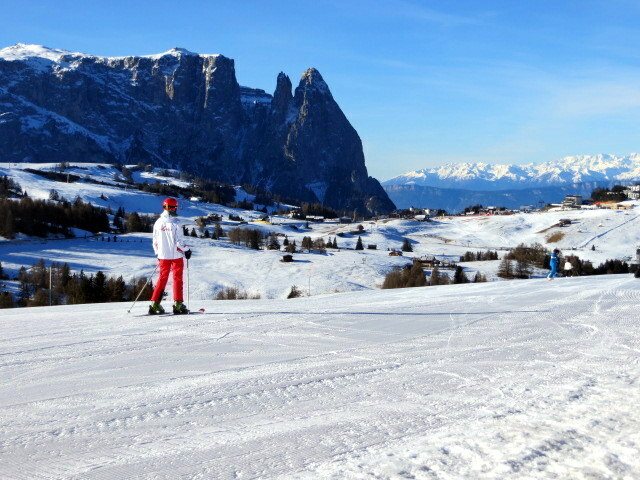 Not a bad view for strudel tasting at Passo Sella. 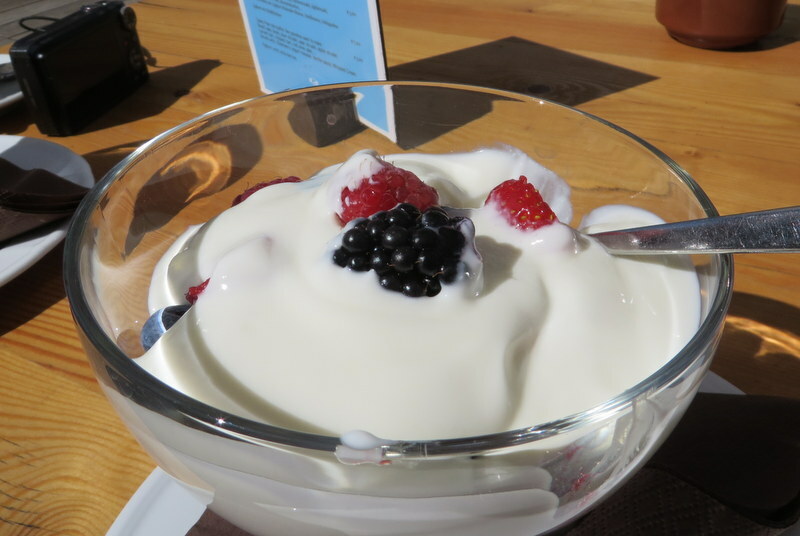 July 10: Today, yogurt with fresh berries replaces strudel at Rifugio Emilio Comici, 2153 meters above sea level. Berries tasted fresh-picked. 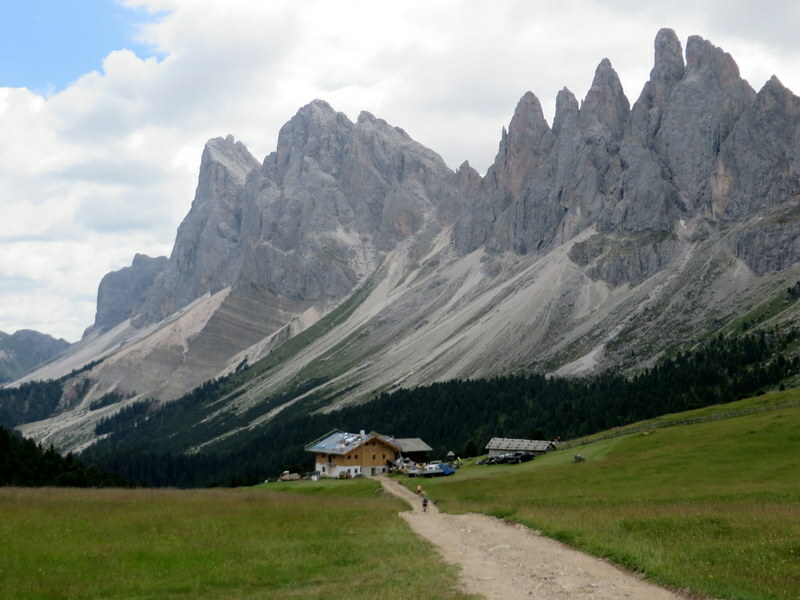 The Rifugio Emilio Comici is perhaps the most amazing mountain “refuge” we’ve seen. 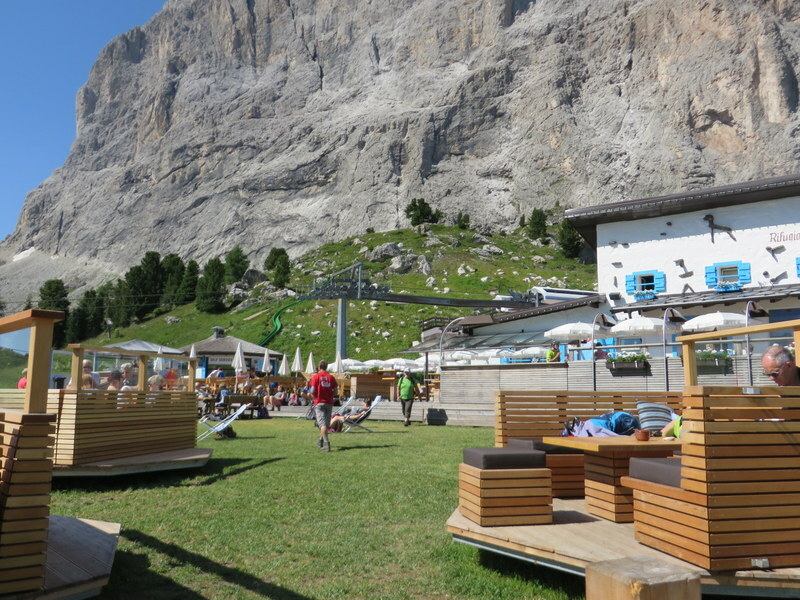 July 14: Rifugio Malga Brogules sits beneath the Seceda Plateau, at 2045 meters above sea level. And still they serve home-baked strudel, of a more cake-like variety. Little Rifugio Malga Brogules, beneath the Seceda Plateau. 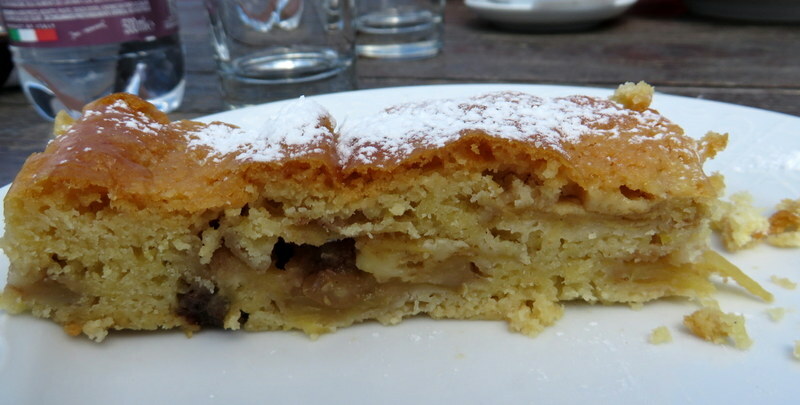 July 16: Best-in-Trip Award goes to the strudel at Hotel Saltria in the Alpe di Siusi. A mountainous piece served with lots of panna, flaky crust, heaps of fruit, raisins and pine nuts. Although we hiked 2 hours to get here, it ruined the possibility of lunch for the day. Our view while gorging on strudel at Hotel Saltria. 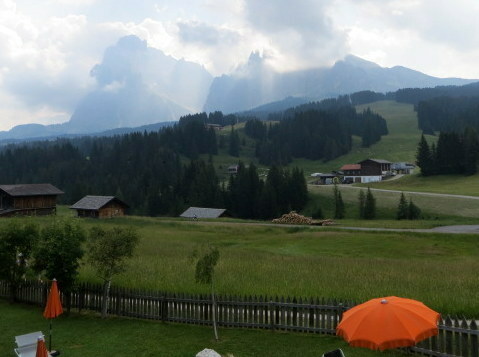 July 18: Last strudel of the trip, eaten overlooking the same scene we cast our eyes on Christmas Day, Hotel Icaro in the Alpe di Siusi. Surrounded by a cake batter, the fruit was flavorful and the strudel loaded with pine nuts as well. Panna of course! 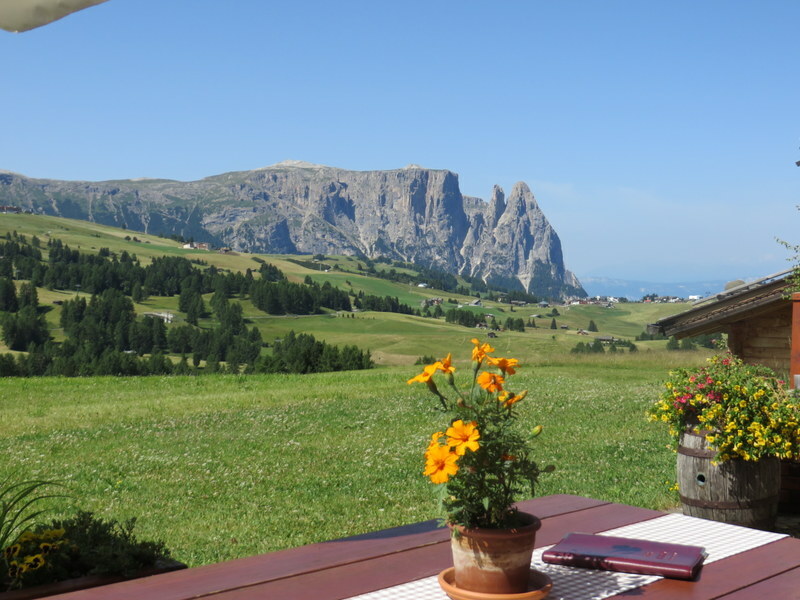 Looking across the Alpe di Siusi from the terrace at Hotel Icaro. A bit of a change from our Christmas Day scene, below. Taken from Hotel Icaro terrace on Dec 25, 2015. We only had cappuccino this time. Well, it is a lot easier to pay for china and flatware when you are not funding the world’s most formidable national defense. Priorities, priorities. Now, may I please have a bite of that strudel? Thank you very much. Boy, that looks rough. Gorgeous views and amazing strudel. I am sure you enjoyed every bit. Hi, Josh. I wish the U.S. could make such infrastructure work. Not only can one take an amazing hike (as ;long or as short as desired) but, the independent businesses that are the rifugi are possible because of the well-developed network of paths and lifts. Having them be clean, using proper dishes, cutlery, etc., and serving great food (not just burgers and such) is amazing! If I could have licked the screen I would have done so. Looks incredible. Very jealous of all the amazing food. Thanks as always for posting such great stuff. Good God, Woman… first we have to put up with photos from all angles of the best pizzas, and now you feel that you have to torture us with practically pornographic full frontal pictures of all you strudel too? I always hesitate to open your blogs because I know I am going to pile on the pounds just ogling – and you know that I don’t have much place left to put the extra weight. I am now so wanting a piece of those delicious apple delights and especially the ones with whipped cream! Gosh those look amazing. Not to be outdone by the scenery. What a country! Italy makes up for its craziness with its food and scenery, no doubt about it! Stay cool, Marcia! What fantastic scenery; both the strudels and the mountains. i love that part of Italy. Thanks, Chloe! After 5 visits, obviously we like it too! In fact, we have tentative plans so spend a month there next summer. More strudel testing ahead. First, though, we will do taste-testing in Switzerland for a compare-and-contrast experience in October. Ciaaaooooo! I think I need to dig out a strudel recipe….oh, wait, still too hot to turn on the oven here….at least in my apartment. Oh, my dear, I see it has cooled off a bit for you, but Roma is already at 37 Celsius when the forecast high was 36! We pray the U.S. has cooler weather when we visit (leaving next week)! 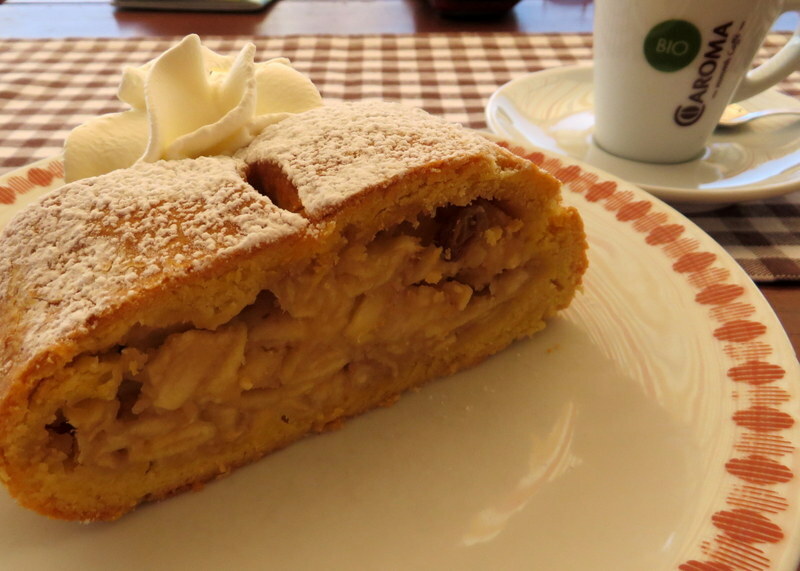 Save the strudel recipe for October, when the apple crops comes in!